One of the lesser-known Rankin/Bass TV stop-motion animated specials is 1968's The Little Drummer Boy. This special was given a sequel 8 years later as The Little Drummer Boy, Book II. Interestingly, both specials were financed by the American Gas Association, a trade group for the natural gas industry. I've never seen the special, but per Wikipedia, "Aaron and his animal friends team up with Melchior, one of the Three Wise Men, to protect silver bells, made to ring for Christ's arrival, from a band of greedy Roman soldiers." 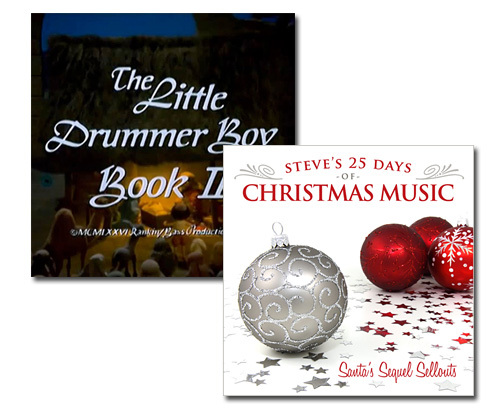 Today's final 25 Days song, The Little Drummer Boy, features some dialogue from the closing of the special, along with the title track sung by a chorus. I felt it was a fitting ending as we celebrate Christmas Day!